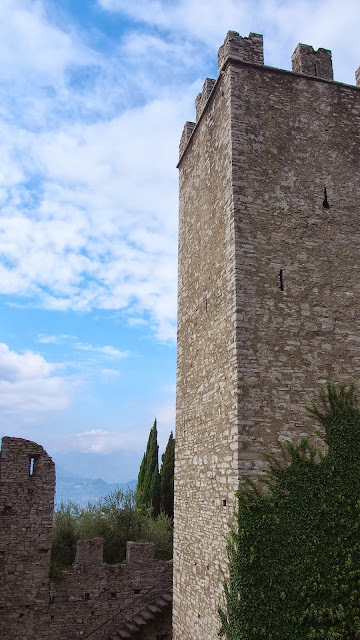 The second thing I wanted to make sure I saw in Varenna was Castello di Vezio. Unfortunately, due to my inability to properly read a map, I spent nearly two of my remaining three hours in Varenna walking in circles, trying to locate the start of the trail up to the castle. 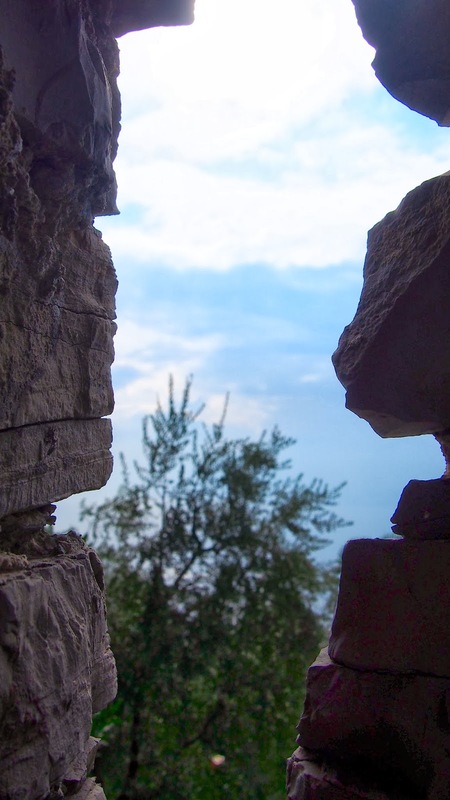 I had just admitted defeat and decided to spend the last hour or so with a cup of coffee Clooney on the lakeshore when I spotted a small sign with an arrow pointing up a hill. 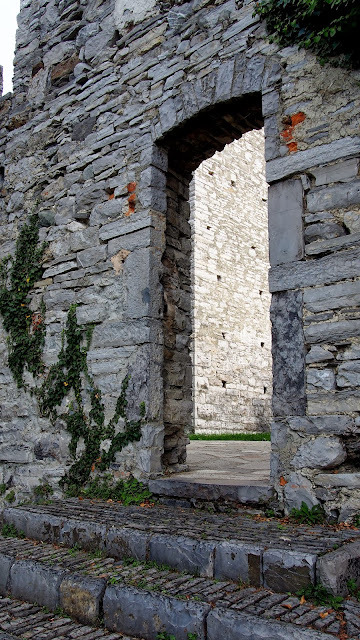 "Mule Trail to Castello di Vezio," it read. Well, there it was! Just a quick little trot up this mule hill and I'd be standing in the ruins of an ancient castle. I glanced at my watch - I had exactly one hour before I had to catch the train back to Milan. That didn't give me much time in the castle, but I just couldn't leave without seeing it. I figured I would be fine; Rick Steves' Italy guide had mentioned that the trail was an "easy, twenty minute hike," and besides, I was a fast walker. This is the first and likely the last time I'll ever say this, but Rick Steves led me astray. While my journey up the mule trail was indeed only twenty minutes, it was easily the worst twenty minute walk of my life. I realized almost immediately that I had a daunting task ahead of me: the hill was quite steep and made of cobblestones, many of which were loose. Even so, this might have been fine - a bit tiring perhaps, but fine - in tennis shoes. But I was wearing a dress and heeled boots. Not ideal hiking attire. Five minutes into my ascent I was tired and sweating. Ten minutes in I was cursing silently for choosing to wear those boots. Fifteen minutes in and I was now cursing out loud, and the last five minutes were spent stringing profanities into a bleak marching tune. Finally, I made it. 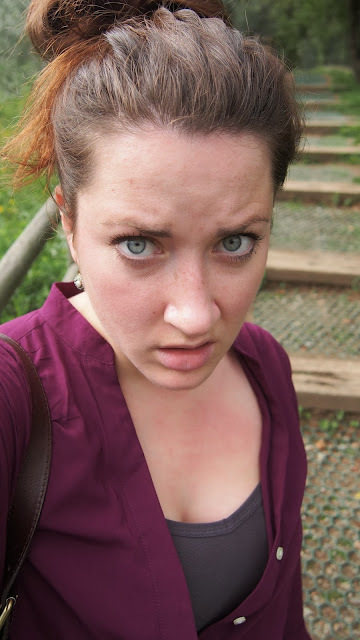 Red faced, sweating, and out of breath, I reached the top of the hill just in time to watch a tour group clamber off a bus that had clearly just driven up the godforsaken hill I just climbed. This castle had better be good, I thought grimly. Well, the castle itself left a bit to be desired; it was really just remnants of the stone foundation and a bell tower. But what can you expect from a nearly thousand year old structure? The land on which it was built is documented to have been of strategic importance for the Romans dating back to the 4th century BC. 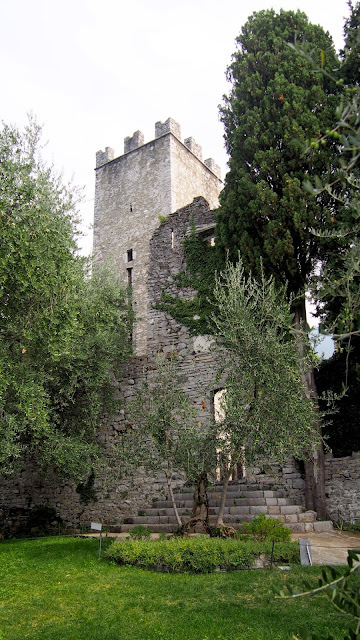 However, evidence of the castle itself doesn't appear in any records until the early 13th century, when Varenna was under seige by Como and its residents took refuge in the castle. To my untrained eye, I would guess it was built well before that; perhaps around the 9th or 10th centuries, and likely only used as a lookout point or fortress of sorts, not as a residence. In any case, a mere skeleton of what must have been an impressive structure is all that remains today. What does and always will remain as impressive as ever is the incredible view. Tiny little towns and boats dot the land and the water below, and the Swiss Alps make for a fantastic skyline as you gaze out from behind the crumbling castle walls. If you climb to the top of the tower, it's even better. I gave myself five minutes of uninterrupted, blissful solitude on top of the tower as I took in the view. I snapped back to reality when I realized I had thirty minutes to descend the treacherous mule trail and get back to the station. I practically ran from the castle to the trail, took a deep breath, and began the dangerous journey. I'm not over exaggerating when I say I rolled both ankles twice and stumbled almost constantly on the way down. It was much more difficult to descend the steep hill in heels and I was strongly considering just taking them off and running down barefoot when I caught sight of a familiar building. I was nearly there. I made it to the train station with a few minutes to spare, only to discover that the train was delayed by about twenty minutes. So besides wearing comfortable shoes if you visit Varenna and plan to see Castello di Vezio, make sure you have enough time. The view from the top of the tower is really quite incredible and I wish I had given myself a bit longer to enjoy it. I also wish my feet weren't covered in blisters, but hey, sometimes sacrifices must be made.